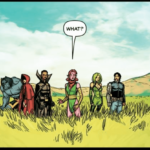 The team has landed in a desert world and they consist of a more animalistic Beast, The Panther – TChaka son of Storm and the Black Panther, Blink from the original Exiles who is pretending she isn’t, Polaris who has magnetic control, Forge who can work with machines and The Witch, Wanda Maximoff who has sort of magic. The tallus gives them their mission to “overthrow machines” and they get attacked by a giant robotic desert centipede, followed by Sentinels. 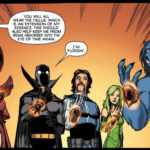 Luckily Polaris is there and makes them take out each other and the final one self destructs. 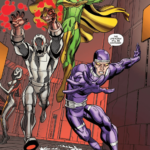 While this goes on Cerebro, Ultron, Machine Man and Vision watch on and try to figure out why they are here and they want to capture them. 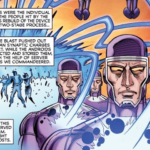 Cerebro wants to merge them into a single mind for a stronger core but Ultron argues they need individuality. Forge and Polaris help to jury rig the robots to move them through faster and they find out the desert they are in is in Pennsylvania and Forge fills people in on what happened. 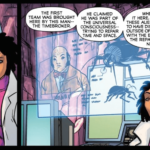 Xavier and Pym ended up meeting and they decided to track all extra-powered organisms so they could help heroes and find criminals. 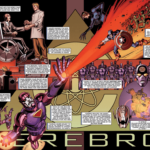 Ultron ended up breaking in and messing with the new Cerebro which did it’s job but Ultron and Cerebro merged together and decided to hunt down and destroy homo sapiens and so it also took over the Sentinels and the Machine Man project and it ended up releasing neutron bombs that destroyed almost all life on North America instantly. Luckily the fallout was designed to disperse and they try to figure out what to do. Polaris suggests they break up into a distraction and an infiltration team and go to sleep. 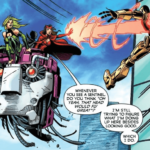 Blink wakes up and sees something teleporting away while Vision, Ultron and Machine Man attack – knocking out Polaris. 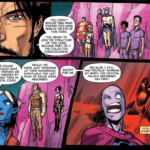 The Exiles are beating them but the androids aren’t there to fight and knock them out as well and take them away while Blink returns with supplies. Blink reaches the town, comments this works is like the Legacy-Vilock world. 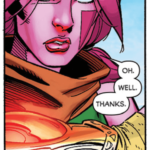 Blink is frustrated and the Tallus tells her where the team is and she sees Polaris has already been dissected. 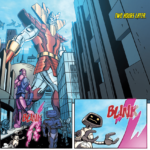 Blink bursts in and the androids return to try and catch her. 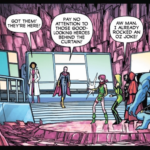 She tries to throw a Javelin at Vision who phases and it destroys Cerebro and her team reveals they weren’t really captured and that they’ve been lying to trick Cerebro. 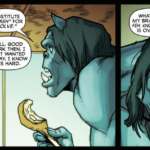 Ultron explains that he is actually Hank Pym and in the last minutes before the attack he transferred human minds into the computer neural net. 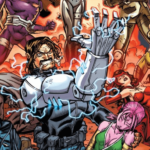 He was able to connect with the Vision and M-51 the independent Machine Man who tricked Cerebro into letting them back up everyone using the machine man bodies and while they couldn’t destroy Cerebro yet, they have them restricted secretly to a single network. Cerebro’s robots come in to destroy more and Ultron tries to get them to stop since each robot has about 10000 lives backed up so they should only destroy the heads. 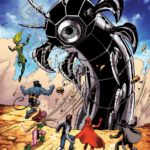 The sentinels get sent in after them so they decide to go into action – Ultron disabled the Neutron field and sent Forge the location so Lorna, Panther and the Witch are the distraction but Beast is hesitant to go on the infiltration mission. They reach the base which is in the remains of the original West Chester X-men mansion but when they get in they find there’s no oxygen. 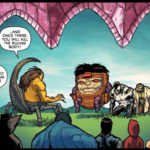 Blink gets them a bubble and Forge asks Beast to help but Beast reveals he got mutated and he lost his intelligence and is still losing it. Meanwhile distraction team is having fun. 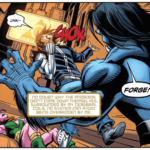 Cerebro ends up taking out Forge’s arm and knocks out Blink and himself and begins taunting Beast who rushes to destroy Cerebro. Outside the Androids try to protect the backups but Cerebro sends her own army to attack. 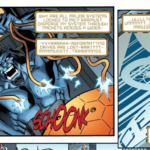 Inside Beast unplugs Cerebro who plans to escape only to find out that they are blocked off and Beast destroys them. 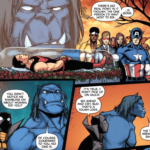 With the army halted Ultron explains the plan to move everyone into Life Model Decoys and they are all teleported out where they meet Morph who explains they now need to go back to the first world and split up the Xavier Gang and the Brotherhood. 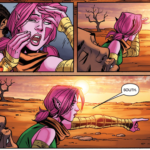 Back on Earth-90631, Princess Wanda and Lorna are getting frustrated about being replaced as the Exiles return and Wanda is knocked out and they get a telepathic block on their Wanda. 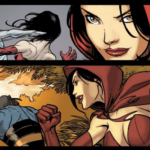 Wanda goes to talk to Jean about Scott. 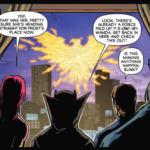 That night Scott has a psychic meeting with Emma Frost which Jean finds and gets angry about and Jean is banished and erupts into the Phoenix which gets all of the X-men summoned out. 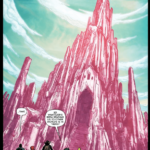 The building around them starts to collapse as Emma and Banshee find them and Emma attacks Princess Wanda, killing her, cementing the work they needed to do and they end up on Earth-Chill where they have 36 hours to relax. 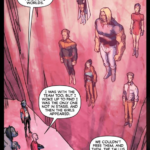 Morph goes to explain some more things because they ask – and basically they had to get Genosha to break up since the humans were close to destroying them. They want to know why Morph knows how it works and he asks them to trust him. They do some more resolving and go to have fun. 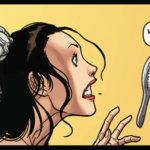 Wanda asks if other people can be brought along and Blink asks if she’s alright having seen herself die. 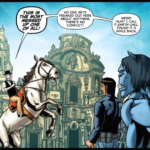 Beast considers staying in a perfect world, Forge wants to see his wife, and the time is over. 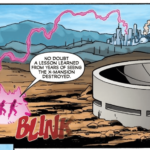 Morph collects them all and as they prepare to teleport, Forge puts something on the Tallus and they find themselves in the field where they initially landed and Tchaka knocks out Blink so they arrive at the Panoptichron. 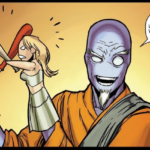 Morph finds Blink and they realize they know everything and Heather is unable to find them. 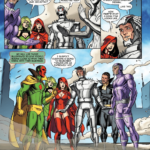 The team meanwhile sees others being recruited by other timebrokers including Impossible Man, Mojo, Howard the Duck and then Blink reappears. 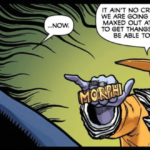 Blink is forced to explain that she planned on pretending until the team was ready and then she’d fake her death but they get pulled into the control room where they find Nocturne, Heather and Morph. Forge explains how they got in, about the initial Time Broker, the bugs, and how people initially got sent home. 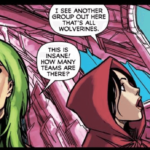 But then they got pulled back into the Panoptichron, including the dead members and Sabretooth who won’t be there forever. 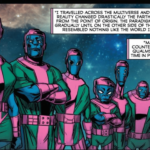 The Tallus turns into an eye and the Panoptichron begins to awaken because they created a loop and the Panoptichron forms into a woman, specifically Kang the Conqueror. She explains how she changed her past and began fragmenting reality which is what the panoptichron reflects – which led to other Kangs and more fragments. She started forming teams that were never meant to go home and the teams began forming part of the Panoptichron – which is why Proteus died in Morph. So Kang woke up because of Morph who brought back his initial team and then they started making new teams. 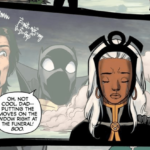 Everyone get to see their home – Forge saved his world and may have lead Black Panther and Storm to hook up, Black Panther killed Klaw for revenge and Shuri is set to be the greatest Black Panther, Hank looks back to see his partner and lover Simon Williams is dead but his memory has been corrected, Polaris’ death brought Magneto to the good side. But because there are more Kangs with their own teams they keep shifting so they get their own Talluses. 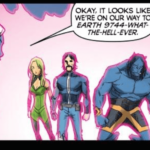 They end up on Earth-9744-Whatever. 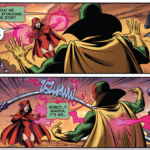 And as they start to prepare and talk about how Kang may not being their guiding force they point out they never saw what happened to the Witch’s universe because secretly this is Princess Wanda and they go off to help Moonboy. 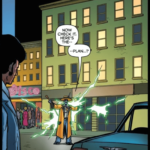 This entry was posted in Exiles, Podcast and tagged blink, exiles, forge, jeff parker by The Watcher. Bookmark the permalink.